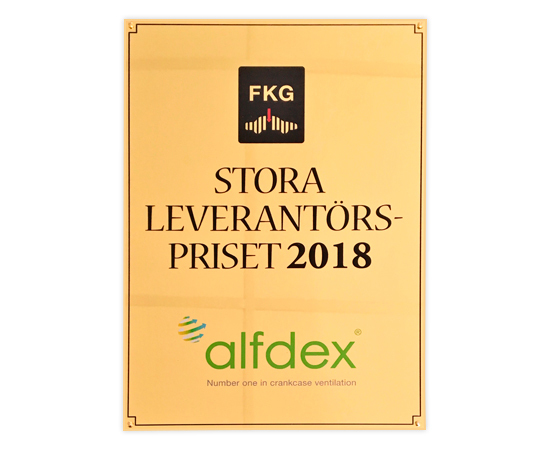 We at Alfdex are proud to have been awarded the Supplier of the Year 2018, “Stora Leverantörspriset 2018”, by “FKG” the Scandinavian Automotive Supplier Association. The award was handed to Alfdex by the Chairman of the board of The Scandinavian Automotive Supplier Association, Per- Ewe Wendel, at its annual “Automotive Supplier day” held in Gothenburg. The Scandinavian Automotive Supplier Association, “FKG”, is the trade association for the Scandinavian suppliers to the automotive industry, with more than 350 member companies.